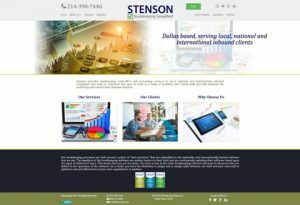 Stenson Financial Services came to us looking to have a website built for their bookkeeping service. We started by creating a custom design concept of the vision we had for their new website. We then built the site in the WordPress Content Management System, so the client would be able to easily manage and make changes or updates to the website. We also built the website incorporating Responsive Web Design to insure that the website looks great on any device and in any browser. The website also incorporates a Portal to a third party file sharing software application within the website which allows our client and their customers to share information. Lastly, we optimized the website and content to perform well in Search Engines and for web pages to load as quickly as possible. GTmetrix is popular website that analyses website performance and speed. The image below is a screen capture showing the performance score and page load speed for the Stenson Financial Services website. The end result is Stenson Financial Services now have website they can be proud of and are another of our satisfied clients.